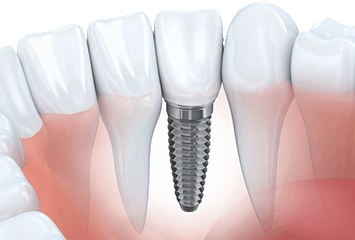 Dental implants are titanium posts that are anchored into the jaw to act as replacement tooth roots, and they are topped by tooth restorations such as crowns, dentures or bridges. They are the strongest, most lifelike and longest-lasting replacement option for missing teeth. Dr. Rapoport and Dr. Schuler always recommend dental implants for eligible candidates, as dental implants are the modern gold standard of tooth replacement. Dental implants feel, look and act just like natural teeth. People usually can’t tell the difference between a tooth supported by a dental implant and a natural tooth. Dental implants have nearly the full biting and chewing power of natural teeth. 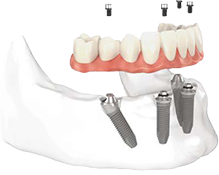 Dental implants don’t require the grinding down and weakening of adjacent teeth, as is part of the procedure for placing dental bridges. 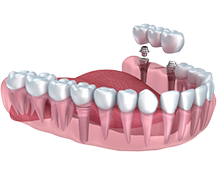 Dental-implant-supported teeth prevent bone loss that occurs underneath missing teeth. This helps the stability of your adjacent, natural teeth and preserves the shape and size of your jaw. Dental-implant-supported teeth fill the gap of your missing tooth and prevent bacterial accumulation that could otherwise lead to gum disease. Dental-implant-supported teeth keep the adjacent teeth stable, preventing them from shifting position and compromising your bite. Dental-implant-supported dentures remain firmly in place, restore close to full chewing power and preserve the bone volume in your jaw. 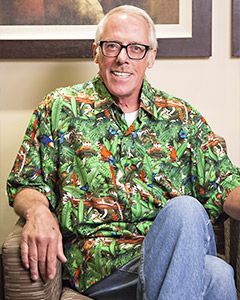 Traditional dentures provide minimal chewing power, may need to be secured in the mouth with adhesives and can slip out of place or make clicking noises when you are eating or talking. 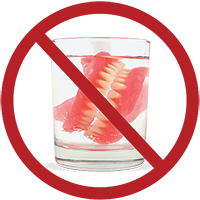 Traditional dentures accelerate bone loss in your jaw and have many other problems which make them a replacement option of last resort. 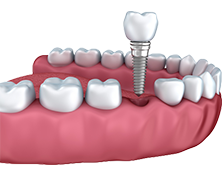 Due to major advancements in technology, most people of any age are now able to safely receive dental implants. This even includes people who have medical problems or severe bone loss around their teeth. If you need extractions, or have missing teeth and do not have severe bone loss, you may be a candidate for implants and functional replacement teeth in the same day.